The artichoke pizza, which the eatery is named for. MANHATTAN — The fire that tore through the famed original location of Artichoke Basille's Pizza on East 14th Street was caused by heat from its overheated pizza oven flue, FDNY fire marshals said Wednesday. Per #FDNY Fire Marshals: Cause of 5/26 2-alarm fire at 328 East 14 St MN was accidental, due to heat from the pizza oven flue. The blaze broke out in the walls of the pizzeria at 328 E. 14th St. between First and Second avenues early in the morning on May 26 and spread to the floors above. The fire caused extensive damage to the eatery, which sees long lines on the weekends. 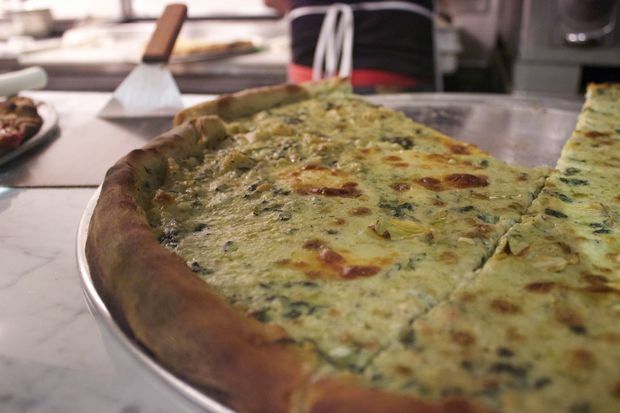 The location opened in 2008 and quickly became a popular post-bar food stop for people looking to fill up on large slices overloaded with artichoke hearts, spinach and cream sauce. A new location was already in the works across the street at 323 E. 14th St. before the fire and opened early so East Villagers could get their fix while the original space remained closed, a worker at the Greenwich Village restaurant told DNAinfo New York. The spot now has eight locations and a reality show on the Cooking Channel.